EMAIL OVERLOAD COSTS AS MUCH AS $1 BILLION a year in lost productivity for a company with 50,000 workers (Intel). How much is it costing your company? Email is the electronic rabbit, multiplying at a pace that's not sustainable. It's time to spay and neuter by putting the humans in charge, instead of the devices. We help you do that with our information overload program, "Control Email Overload," which can save your organization money, time, and your best talent. UNBOUNDED EMAIL TAKES A HUGE TOLL, not just on productivity and the bottom line, but on attention, teamwork, and talent. Attention is the chief productivity tool. Interruptions erode impulse control, so that we can't regulate attention and impulsivity. The more you check email, the more you have to check it! Interruptions blow up working memory, causing disruptions to performance. They increase aggravation 106% (Bailey, Konstan), which makes tasks take longer to get done and seem more difficult than they actually are, which drives stress and burnout.. It doesn't have to be this way. With proven strategies developed by researchers and the best practices, your team can get information overload and interruptions under control. Cut the siege of messages, save vast amounts of time and money due to lost productivity, and help your organization get more done in less time. Click on the button above or the one below for pricing and details on our email and interruption management training programs. There is light at the end of the in-box! 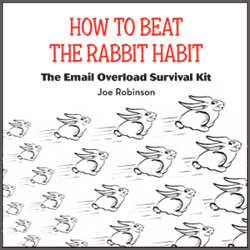 PARTICIPANTS In the training program get a free digital copy of Joe Robinson's audio program, "The Email Overload Survival Kit" which gives them practical strategies to help cut the staggering volume of messages. Email proliferates like rabbits. Each email results in six messages, three going, three coming back. The average corporate user spends the equivalent of 100 days a year doing nothing but email. Think of the work that could get done if you got some of that time back. Click one of the buttons on this page to learn more about our email and information management trainings and how to get your team out of email triage and back to work. SET THE TERMS OF ENGAGEMENT. Joe Robinson discusses how impulse control and sanity are being shredded by unbounded email and interruptions. Joe has appeared on the Today show and CNN, and has led programs for organizations from IBM, to Kellogg's, McDonald's, Pfizer, LEGO, and Anheuser Busch. UNBOUNDED MESSAGING is unsustainable, which is why companies such as Deloitte and Intel are mandating less email usage. Now you can get the avalanche of emails, IMs, and even texts under control with a management system that increases productivity and effectiveness as it cuts stress. Nonstop email and interruptions increase the perceived difficulty of tasks and double and triple the chance of errors. This staff training program brings sanity back to work with management practices proven by the science to be the most effective in controlling email abuse. Our email management program teaches your team strategies to manage excessive interruptions, email, IM and other intrusions, such as working-memory-fracturing habits like multitasking, and reclaim the treaure lost in the fray, attention. They get email strategies that can turn the siege around and end overwhelm. We work with you to create email norms in an Email Etiquette Rulebook. Right now, there are no rules, which is why anarchy reins. The more control we have over messaging, the less stress, the more attention, and the quicker the work gets done. Your team will be able to dramatically improve productivity and sanity with the strategies in this program. Your organization will see enormous cost savings in lost productivity due to out-of-control email. Don't panic. The humans are in charge again.